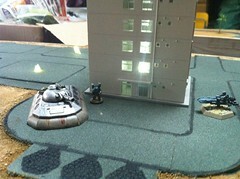 Testing the lights on the terrain. This weekend has seen many hours spent in the Garage and at the computer to complete the first draft of the Critical Mass Games PDF army cards. Richard, Russ and Simon joined me today in the Garage and we took the entire layout forward a couple of steps. 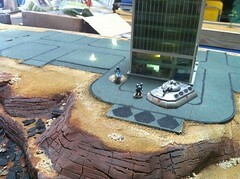 The base sand work is now drybrushed and most of the layout has a base coat. Lots of static grass, brush, scrub and super detailing are now needed over the next two weeks before Salute. In this photo you can see the lights in the building, although I discovered that the clear lighting element in the building is designed to light the rear stairs up rather than the large front window! In most of this weeks photos on Flickr you will find the two board sections are facing apart, this was to allow us into the rock face areas to start to add detail in the riverbed. An honorable mention to Richard the "King Pin" this week for his excellent work pinning the steel girder bridge section together which is the centre piece of the board. You can't see the bridge in the photos but next weekend it will start to come together when we re-align the two sections and add the "drop on" bridge.